The Sherwood Teatro 6F Floorstanding Speakers are designed to reproduce the full audio range, true to life imaging and bass. 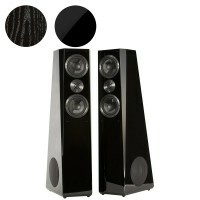 This speaker can be purchased as a standalone pair or as part of the Sherwood Teatro 5.1 Home Theatre System. The Prime Tower is a reference-grade loudspeaker with pinpoint accuracy, exceptional tonal balance, effortless bass response and all the qualities of the best floorstanding speakers available. Every aspect of the Prime Tower speakers was designed for sonic excellence. Dual opposing 8-inch woofers command a room with deep, articulate bass while the innovative driver design, premium materials and optimised cabinet geometry combine to convey incredible resolution, absolute transparency, and crisp, powerful dynamics. These Swans Diva floorstanding speakers encompass a design that can only be described as pure elegance. These first class speakers provide high end performance at a fraction of the cost that other speakers of comparable quality demand. 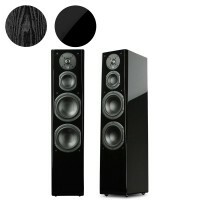 The Swans RM600F floorstanding speakers have a unique driver configuration, easily dealing with the new generation of high definition sound. Each driver was specifically developed to work in concert with each other and offer the latest in electro acoustic technology. A perfect combination of solid wood cabinets and premium drivers. Not only can these exceptional speakers be used in a Hi-Fi system for music enjoyment, but they provide excellent high definition performance, which are well suited in home theatre applications. The Swans M806 design is exactly the same as M808, a comprehensive interpretation of Swans high end products. The M806 is crafted with a high quality walnut cabinet, carefully manufactured through a number of manual processes. The M808 is designed with a high quality walnut cabinet. Within the cabinet is a complex, strengthened skeletal design which effectively avoids interaction between the various internal components, greatly reduces resonance, and ensures high dynamic range.